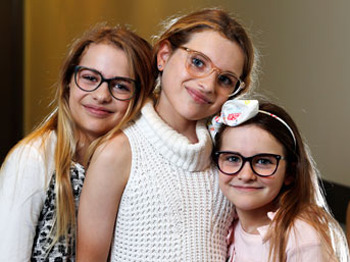 Did you know that approximately one in five Australian children suffers from an undetected vision problem or requires ongoing assessment? Resident optometrist from Optometry Australia, Luke Arundel, said that many children and parents are unaware there might be a problem, because they just assume their vision is normal. 'They don't know what they don't know!" he said. 'Good vision is crucial for a child's educational, physical and social development," Mr Arundel said. 'So it's important to be aware of the possible signs of a vision problem to give every child the best chance of reaching their full potential." Lots of squinting or having trouble recognising people in the distance. If your child is sitting too close to the TV or computer, asking to sit up the front in class to see the blackboard, or doesn't recognise grandma across the room, this is a likely sign that your child is suffering from one of the fastest growing health epidemics in the world – myopia (short sightedness). Frequent blinking or eye rubbing. While it's common for a child to rub their eyes when they're tired or upset, if your child rubs their eyes while they are trying to concentrate on something – such as reading a book – or while they are being active, it could mean they have an eye problem. Using a finger to guide eyes while reading. When children learn to read and are sounding out words, they'll often use their finger to track which word they're on. But eventually they should be able to focus and not lose their place. If after a while your child still uses their finger, ask them to try reading aloud without pointing. If they have trouble, they may have a vision problem. Slipping grades. Good vision is a crucial factor in the ability to learn properly. So when your child has trouble seeing the blackboard or screens, it could naturally lead to difficulty at school. If your child's school performance starts to drop, it might be because they need their eyes checked. Head tilting. Your child may just look inquisitive or cute, but a regularly tilting head is also a symptom of an eye disorder called strabismus, a muscle imbalance that prevents the eyes from moving in alignment. It could cause double vision, and head tilting helps minimise that. Eyes don't line up or one or both eyes wander. Watch your child when they are talking or doing activities. It is often very noticeable if their eyes don't line up, which can be another sign of strabismus. Other times, however, it might only be noticed when a child is tired or looking at something very closely. Children can be born with strabismus or develop it in childhood. Often it's caused by a problem with the muscles that move the eyes, and it can run in families. Complaints of headaches. If a child's eye muscles have to work harder to put images into focus, eye fatigue or eye strain will eventually set in which could cause them to complain of headaches. Sensitivity to light. Have you noticed that your child's eyes are particularly sensitive to sunlight, indoor lighting or camera flashes? They might have a condition called photophobia, which can also lead to headaches or nausea. Closing one eye to read or watch TV. If your child frequently closes one eye, this could indicate a refractive or binocular vision problem that interferes with the ability of their two eyes to work together comfortably as a team. Avoiding using a computer because it hurts their eyes. In today's world of digital gadgetry, digital eye strain is common among children. To help prevent this modern eye condition, ensure that your child takes a break every 20 minutes to look at something at least 20 feet away for 20 seconds while they are using a digital device. 'It's important to keep an eye out for any of these signs," said Mr Arundel. 'If you notice any of them, please take your child to an optometrist for an eye examination – it could be the most important exam they have. 'In fact, we recommend having a regular eye examination from childhood and then throughout life", he said. To find an optometrist near you, go to goodvisionforlife.com.au.